Hi everyone. Time for a reminder card for the CAS Christmas March Challenge - Deer, being hosted by our very talented Susan! 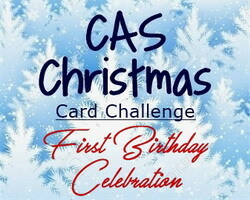 It's also our 1st Birthday Party, so I hope you'll play along and celebrate this us! The card above is very simple. I recently got a new embossing powder called Fractured Ice. I used it on the bottom of my tree / deer die-cut and also added some random patches in the sky with my Versamark and heat embossed with the same Fractured Ice embossing powder. The sentiment is stamped in black to pick up the specks of black in the embossing powder. Super easy and quick card. The photo doesn't do the card justice ... the embossing powder is very pretty. Please check out the challenge blog to see the amazing reminder cards from our DT and from are wonderful Guest Deigner, Chrissie. 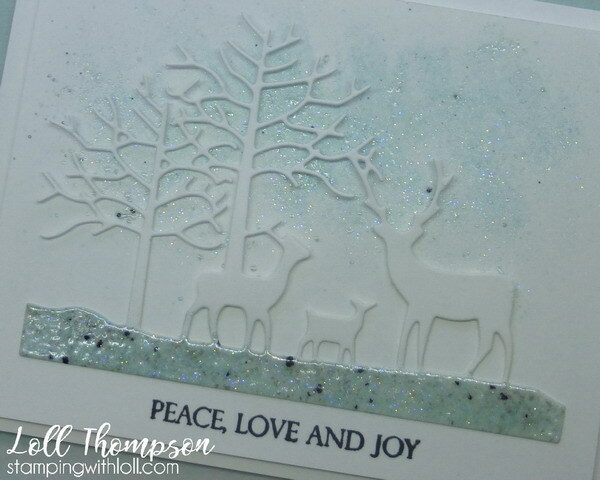 Love the Fractured Ice embossing powder - such a great wintry colour! Perfect with that die cut and the black sentiment. how pretty...love the shimmery look. Simply beautiful. What a fun and unique embossing powder. Wow! This is so lovely, Loll! 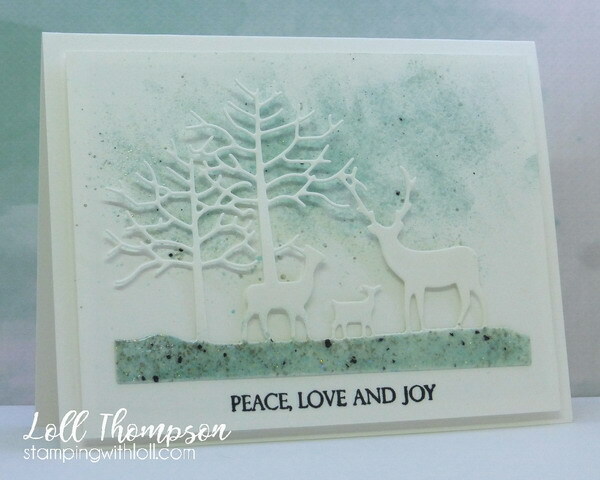 The soft colors and the grainy texture of the embossing powder look fabulous with the pretty white deer die-cuts. I especially love the way you applied the powder in the sky. Fantastic job, my friend! That added sparkle totally makes this card a stand-out, Loll! Once agains, thanks for sharing a great idea! What an impact that fractured ice has! Love the sparkle and wonderful color or winter. This is beautifully composed, Loll! This is gorgeous Loll, I love the icy colour you used. I think I have all these dies, I may have to try something similar! Thanks for having me as GD this month! Love all this sparkle, Loll! I love the variation in color that works perfectly with this die cut scene! What a fantastic product! Very cool embossing powder! Love the glitter in the sky and the beautiful die. 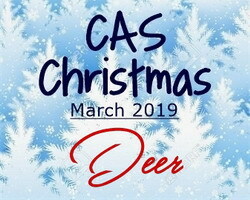 Over and over again you show how absolutely lovely CAS can be! Beautiful card. That Fractured Ice embossing powder is very pretty and sparkly.